- 是蜜蜂从植物花蕊中采集的雄性生殖细胞。蜂蜜采集时将许多花粉混入花蜜, 装进两足后, 常回蜂房, 加工后变成蜂蜜的主要营养食物. - Bee Pollen is one of the better and rich of natural ingredients as foods. - It is the seeds of a blossoming flowers collected by bees. During its collections, enzymes from the bees synergized with the flower pollens to form the bees’ pollen for nourishing bee’s larva. - Rich in Protein, various kinds of vitamin, amino acids, enzymes & co-enzymes, minerals and other microbial compounds. Eco Thai selects the best quality of Bee Pollen, mixing it with Raw Honey and only 2 ingredients used. 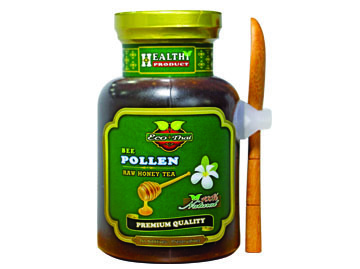 No additives or preservatives added in retaining the purity of Bee Pollen Raw Honey Tea, which is easy to prepare healthy beverages or foods and enjoy the natural taste. شاي حبوب اللقاح بالعسل لا يمر بعملية التسخين غني بالبروتين، الفيتامينات، الأحماض الأمينية والمعادن للصحة على الجسم السليم والنوم بشكل جيد، مناسبة للتناول، مناسبة للنساء لزيادة تدفق الدم، يمنح البشرة بياض مشرقة وتقليل التعب.